Form MVU-26 is a Massachusetts Department of Revenue form also known as the "Affidavit In Support Of A Claim For Exemption From Sales Or Use Tax For A Motor Vehicle Transferred Within A Family". The latest edition of the form was released in June 1, 2004 and is available for digital filing. 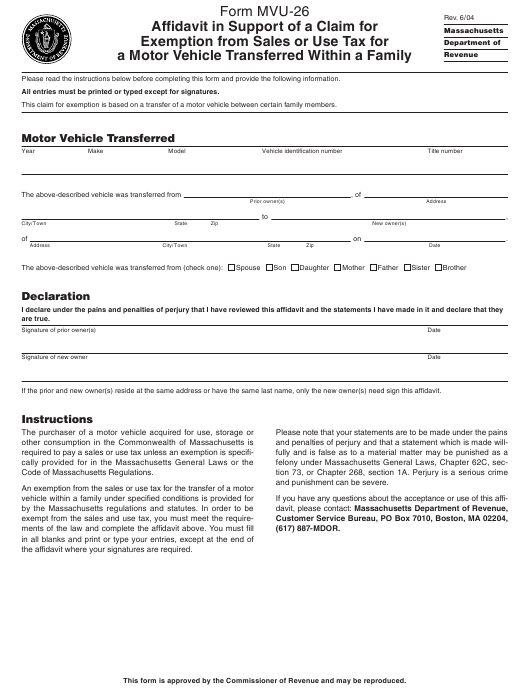 Download a PDF version of the Form MVU-26 down below or find it on Massachusetts Department of Revenue Forms website. This claim for exemption is based on a transfer of a motor vehicle between certain family members. If the prior and new owner(s) reside at the same address or have the same last name, only the new owner(s) need sign this affidavit. the affidavit where your signatures are required.